"The Emperor has sent an alternative solution." Fantasy Flight Games is proud to announce the upcoming release of the third wave of expansions for Star Wars™: Armada! The Galactic Civil War rages on, and so do the tactical fleet battles of Star Wars: Armada. In Armada, you assume the role of fleet admiral with either the Galactic Empire or Rebel Alliance, assemble your ships, and fly to meet the enemy. The combats are big and brutal, and your strategy must balance your focus on the objective against the destruction of your enemy. The game's rules for fleet building permit you the freedom to fly the ships that best suit your strategy, and each wave of expansions adds new options for you to pursue. Wave I allowed you to build your fleet to full strength, introducing a classic assortment of ships and starfighters, including Victory-class Star Destroyers, Nebulon-B frigates, TIE fighters, and X-wing squadrons. Wave II increased the game's scope even further, adding the Imperial-class Star Destroyer and Home One as the first large-base ships and increasing the standard fleet build to a full 400 points. Now, even as the game's core experience remains rooted in your ability to plan your approach, command your ships, and obliterate your enemy, Wave III introduces yet another dimension to your battles. 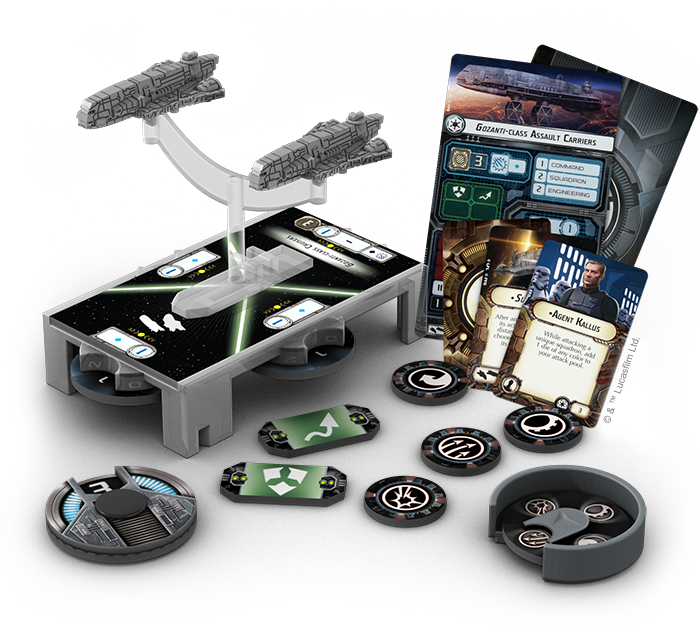 Its two expansions, the Imperial Assault Carriers Expansion Pack and the Rebel Transports Expansion Pack, introduce the "flotilla" to Armada. Treated like standard ships—with a couple of notable exceptions—flotillas come with a host of inexpensive, highly tactical abilities that allow you to coordinate your fleet more closely than ever! The flotilla enters Wave III as an all-new type of ship. Flotillas operate in most ways the same as larger ships, but because they represent multiple, smaller ships, flotillas feature two plastic ship models, instead of one. Apart from this difference, they follow the same rules as other ships, with one exception—when a flotilla would overlap or be overlapped by another ship, only the flotilla takes a facedown damage card. You do not deal a facedown damage card to the closest ship the flotilla overlapped unless that ship is also a flotilla. Flotillas, however, do more than merely introduce a new type of ship; they also introduce a new fleet support role that you can incorporate into your fleet and games. 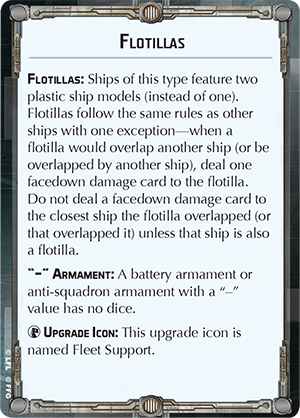 Both of the flotillas in Wave III feature the Fleet Support upgrade icon. 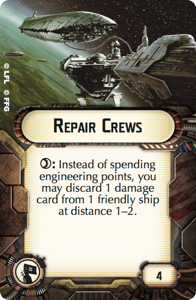 These upgrades are remarkable in Armada because they do less to improve the ship that bears them than they do to boost the rest of your fleet. Bolster your squadrons, repair your ships, or improve your larger ships' ability to respond to immediate threats—Fleet Support upgrades ensure that your flotillas can play a useful role in any attack plan. The popular Gozanti-class cruiser arrives to Armada in Wave III in the Imperial Assault Carriers Expansion Pack. With just one die in their left, right, and forward battery armaments, and no dice to fire from their rear arcs, your flotilla of Gozanti-class cruisers is not going to intimidate your opponent into surrender, but only a fool would dismiss their impact. First of all, a flotilla of Imperial assault carriers comes with a fleet-point cost more comparable to your fighter squadrons than your other ships. Next, it gains a surprising measure of survivability from its scatter and evade tokens. Most important, however, is the wide range of abilities that your Gozanti-class bring to battle with its new Fleet Support upgrades. Of the expansion's eight upgrades, half of them bear the Fleet Support icon. Unlike most upgrades, these do not add muscle to the ship that equips them, but to the other ships and squadrons in your fleet. 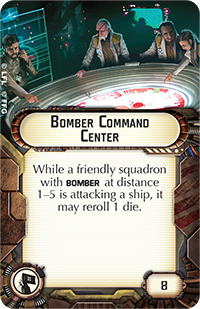 Accordingly, you might use your Imperial assault carrier to add punch to a Bomber build by equipping a Bomber Command Center , or you might equip a Comms Net to provide critical command flexibility to your larger ships. No matter which Fleet Support upgrade it equips, your flotilla of Imperial assault carriers does more than add another piece to the puzzle; it binds those pieces together. The counterpart to the Galactic Empire's Imperial Assault Carriers Expansion Pack, the Rebel Transports Expansion Pack introduces a flotilla of GR-75 medium transports. You can then field these ships as either GR-75 Combat Retrofits or as GR-75 Medium Transports, the first ship in Armada to have no inherent ship-to-ship combat capability. Still, for what it lacks in its own punch, the Rebel Transports Expansion Pack more than supplies in support. 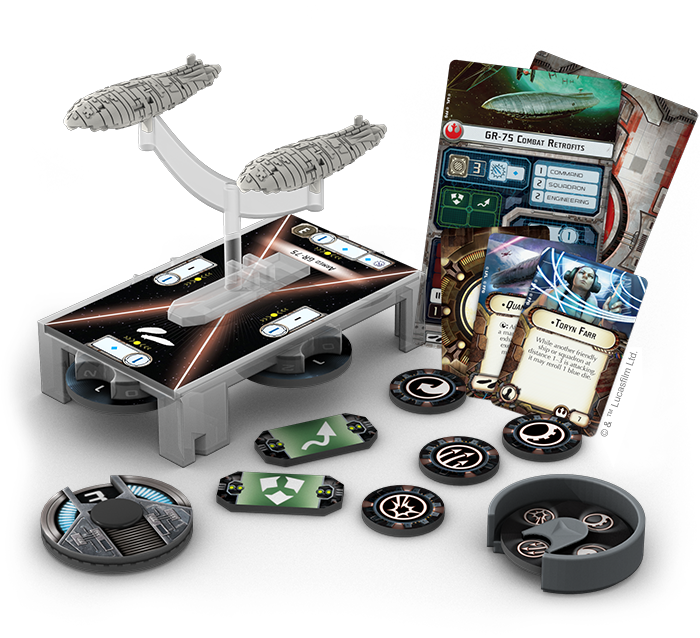 As with the Imperial Assault Carriers Expansion Pack, four of the eight upgrades in the Rebel Transports Expansion Pack feature the Fleet Support icon. 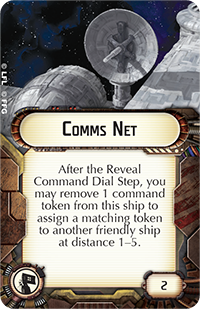 This means you can use a flotilla of GR-75 transports to relay commands to your larger ships with a Comms Net, or you can trail behind your largest ships with Repair Crews to keep them in the fight a bit longer. And that can make the difference between victory or defeat. After all, even one additional round of fire from your Home One is easily going to outstrip the contribution that nearly any other Rebel ship could have made over the course of two or three rounds. The Rebel Transports Expansion Pack's focus on fleet support does not stop with its Fleet Support upgrades, either. It also introduces a new commander and a crew member who can provide free rerolls to friendly ships within distance one to three. "All troop carriers will assemble at the north entrance. The heavy transport ships will leave as soon as they’re loaded." As a game of massive fleet battles, Star Wars™: Armada has always rewarded sound strategy and clever tactics. Likewise, its battles have always revolved around your ability to achieve your objectives. Soon, the new flotillas and upgrades from Wave III will elevate these game elements to even greater heights. Use them to maintain your focus on the objective, or use them to gain an advantage in combat. Either way, these new flotillas add an exciting new dimension to your battles for the fate of the galaxy. Brace yourself for fleet battles that are tighter and more tactical than ever. Armada Wave III is scheduled to arrive at retailers in the third quarter of 2016!